This detailed guide was developed by LEA Global firm member Dezan Shira & Associates and this issue covers How to Remit Service Fees and Royalties and How to Remit Profits as Dividends. When setting up in China, foreign investors are often confronted with complex tax compliance issues and licensing procedures, paying scant regard to one of the most important parts of overall business planning: the effective maximization and subsequent repatriation of profits. China maintains a strictly regulated system of foreign exchange controls, meaning funds flowing into and out of China are tightly regulated. Therefore, for foreign companies with subsidiaries in China, repatriating cash from their subsidiaries has always been an important and challenging issue. It is important to incorporate a profit repatriation strategy into the set-up planning of a subsidiary in China to ensure one’s ability to access the profits it earned. 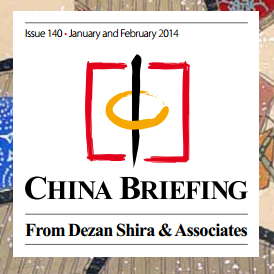 This issue of China Briefing guides you through the different channels for repatriating profits, including via intercompany expenses (i.e., charging service fees and royalties to the Chinese subsidiary) and loans. Also covered are the requirements and procedures for repatriating dividends, as well as how to take advantage of lowered tax rates under double tax avoidance treaties.